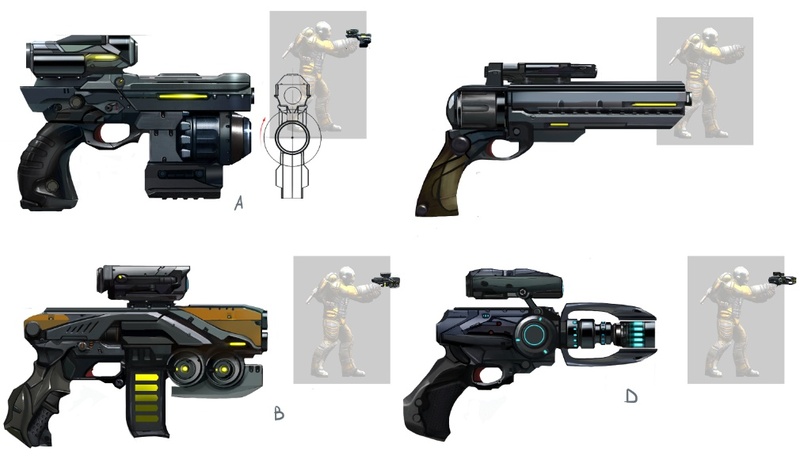 The Pistols is one of Weapons type in the Evolution: Battle for Utopia game. Pistols are the only weapons you can use without expending extra resources in the form of Ammo or Crystallite. As such they are essential to your advancement within the game. The Pistols is the only type of weapons in the game, that can perform an Aimed Shot. – Regular Damage. Good for unarmored targets (100% damage), but totally useless for armored (0%). This type of damage is common among pistols (5 of 15). – Energy Damage. Good for unarmored targets (100% damage) and useful for armored (50%). This type of damage is also common for pistols (7 of 15). – Incendiary Damage. Excellent for unarmored targets (130% damage), but totally useless for armored (0%). This type of damage have only two Dragon pistols. No need to waste Skill Points on improvement of its first version, because by the time the Dragon-1 appears, everywhere are a lot of armored enemies, against which it is useless. – Acid Damage. Good for unarmored targets (100% damage) and just brilliant for armored (130%). This type of damage also has only one pistol (Acid). The most versatile and definitely “must have pistol” at the first part of the game! However, almost the very slow fire-rate of all. The DPS also known as Damage per Second (and not Damage per Shot) formula credits are entirely for ScaryCherry. The DPS value takes into account the Reload Time. The Improvement value is just a straight calculation that compares damage from previous and next pistols. All the calculations are not taking into account any researching from Reconnaissance Center, Critical Shot update or additional damage from acid or incendiary post-effect. Can someone explain exactly how the acid and incendiary damage types work? I fully upgraded the Dragon-2 pistol and it seems to do around the same max damage as the fully upgraded Kurbatov’s Pistol against unarmored targets. However it seems to apply a damage over time effect that ramps up and does more each tick, with each additional shot? I am guessing the bonus damage has no effect on aimed shots though? Yes, single shot damage is equal to regular pistols, but over time, you’ll see some (red) health points coming out from enemy… Those ones are the incendiary damage which is up to 130% for unarmored targets. However. aimed shots only relies on the Enhanced Optics level you have, Vulnerabilities research for each enemy at the Recon Center (and I can’t remember any more feature that aimed shots relies on)! Acid damage is the same but it only deals 100% to unarmored targets. However, it can deal 130% for armored targets. If you click in your profile button, in the game (2nd button from the left, next to Menu button) and then, again, 2nd button (Reference table) you can see info on each type of damage you can find in the game’s weapons. And yes, Dragon 2 max damage will be the same (for the same conditions) as Kurbatov’s as you can see at the table above which says 268/453. Dragon inflicts Incendiary damage and Kurbatov’s inflicts Energy damage! That’s right. I can add that damage bonus is not +30%, it varies between +5% (at first shot) and encreases to +30% at next shots. If you wait or change a target, you can see how additional damage decreases to zero. Is that correct? Can anyone confirm this? What are you trying to compare? (Damage per Second) per Shot??? I’m not following! I want to compare the damage a pistol does over time, hence “damage per second” (DPS). Ignoring reload time, the M5 SMG does 641.25DPS, whilst Dominion does 608DPS. So, Гудвин is right: the Dominion pistol is better; but not that much (12,8%). Note though that I don’t know the reload sliders and thus how much reloading can be speed up by manual triggering. If reload time can be reduced to 1s for both pistols, numbers are 561,27 and 552,73 respectively – making the M5 SMG equally strong as the Dominion.However, Dominion‘s aimed shot should deal way more damage. So I guess for those guys that do the secondary story-line fully, getting the M5 SMG is quite worth it (given that the UFO pistol only does 289,3 DPS and Pegasus 272,3DPS). That’s more correct. I can add that with bonuses (reload, attack, reconaissance) the difference will increase. And one more thing: may be it was the fix in update, now Dominion has much faster fire rate then UFO. So, the information in the table is not exactly correct. ScaryCherry, what’s your formula? Looking at your calculations your units don’t work out. (shots/mag)*(damage/shot) –> damage per magazine. If you divide this by shots/second (i.e. multiply by 1/1/second) you move seconds to the numerator. How did you get from 4500 to 10,175 for the M5 for example? Maybe I’m not understanding your reasoning.. can you write out the entire formula? No. Dominion is much better. You ignoring reload rate. It’s a big mistake. It will give you the Damage for any pistol but also having in account the Reload time! ScarryCherry I didn’t followed your calcs… What is that time you calculated??? 10.0175s and 12s??? I can see that is (Shots per magazine)/(Fire Rate + Reload Time) but I didn’t understood the math!!! is it really worthwhile to buy the kurbatov’s pistol?? i want to make one gem purchase and which one would be d best buy – kurbatovs pistol, dominion mg, terminator or anything else ?? I think that someone already said the the only truly worthy buy in the game is the Kurbatov’s Pistol! If it is true or not I don’t know but I would buy it for sure! I will buy it when I have the chance! Kurbatov’s pistol is the best choice for your situation. Acid cannon is better then Dominion MG for most situations (exept PVP defence). Some bosses (Hehemon and Hand Of Xi) need yo use the MG, but you can use Moloh MG on them (they are not armored). And the best partner is Hank (he has more HP and the same damage, comparing with terminator). I use the pistol at 95% of the battles time. The secondary weapon is only when the enemy comes towards you or when you know that the pistol simply is not enough. But this situation doesn’t happen very often. The pistol is the most used weapon! You should upgrade each pistol you research to it’s maximum as you’ll use it a lot and it has free ammo! So, it is always a must have asset! Is the Dragon-2 worth constructing with the Dominion pistol around the corner. I mean as most enemies are armoured anyway it wont probably be of much use. I don’t even have G2-inc grenades so I have to pay a higher research price – not such a big deal though. Where do you get those G2 incendiaries, by the way. I have not researched the Dragon-2 because I already have Dominion. G2 incendiary comes only from the smugglers offers! I love the Dragon 2 pistol, it is well worth researching and upgrading. It is especially good in the early stages of the Dominion as the majority of enemies are not armored! I now have Kerbatov’s pistol fully upgraded, but use the Dragon 2 most of the time especially with the random missions, because again, most of the enemies are not armored. The Dragon 2 is also as good as Kerbatov’s on an aimed shot, even against armored enemies. For armored enemies I either use Kerbatov’s or if there is only one or two armored I’ll use the Dragon 2 with the Acid Cannon and use the Acid on the armored and Dragon 2 on unarmored. i have reached lvl 64… but not getting kurbatovs offer… why is dat so ?? I’m at level 60, Dragon pistol researched but not produced. Already reclaimed 2 captured mines, but didn’t get Dragon-2. The Dragon must be both researched and manufactured? No nothing’s wrong, I got the Dragon-2 pistol thanks to Dragon pistol’s research (not produced) but I reclaimed at least 3 mines before I could get the Dragon-2 research. Problem solved, I haven’t read the instructions precisely. How long does the 20% reload bonus last for? Is it only the first round out the chamber, the whole clip, or some other time limit? I’ve tried visually observing in battle, but I’m still not sure. Hey guys. I just want to know, the req for dragon 2 is to research the dragon first right? What if I dismantled the first dragon pistol? Will I still get the dragon 2 as reward after reclaiming any mines captured by the viper and executioner? Any help is appreciated. Thanks! Hi, i have level 54, but i can’t find acid pistol, why? Thx for answer. Dragon-2	453	10%	16	#DIV/0! Kurbatov’s Pistol	453	10%	18	#DIV/0! The above numbers take into account the damage per bullet, then it multiplies with magazine size and with average critical to compute the whole damage done by a full mag. then it divides this by the time it takes a full mag to be shot – the magazine size multiplied with time a bullet takes to be shot – plus the time the mag needs to be reloaded. beyond the above numbers, one should also take advantage of the fast reload and bonus reload areas. The fast reload allows u to finish the reload immediately and the bonus reload finishes the reload immediately and ads 20% damage to the whole clip. Using those 2 types of reloads, one can improve the dps by lowering the reload time and by also increasing the damage of each bullet. Dragon-2	453	0	0	10%	16	#DIV/0! #DIV/0! #DIV/0! Kurbatov’s Pistol	453	0	0	10%	18	#DIV/0! #DIV/0! #DIV/0! For free damage, the ufo still tops pegasus in damage, 10% bigger if u go with normal / bonus reload. I’d advice going with fast reload, just reload as soon possible, u’ll get almost the same dps as waiting for the bonus to be available. it will give 399 dps for fast instead of 406 for bonus. This way, u’ll benefit of a a good damage along with a decent 1.5 reload time. As soon u can get the dominium, do it, no payment required and great bonus dps, 686. I like your formulas better.. do you have an Excel sheet you could email me? if this goes well, the table will look much better, the previous tables were not html, but ods table. if i have cobra pistol , then can i dismantle bulldog pistol for skill points ? does it is used in any further in the game or not ???????????????????????? ?